The next day, we had a quick breakfast (from Lalit Mahal’s restaurant itself – piping hot and delicious idly-vadas) and caught an auto rickshaw from outside the KSRTC bus stand. The auto driver, while on the way to the Gol Gumbaz, offered to take us to all the sights in Bijapur for, what was in his opinion, a measly sum of 700 bucks. Last night’s cheap dinner was still on our minds and we thought it was too much – so we bargained down to 500. That would make it a 100 for each of us, which was still too much, a mistake that we were to realize too late. Wikipedia states that Bijapur, initially known as Vijayapura or the City of Victory, was established by the Chalukyas and later, taken over by the Yadavas. It was only during the subsequent rule of the Deccan Sultanates that Bijapur attained many of its famous Islamic landmarks. In due course of time, Bijapur was taken over from the Deccan Sultanates by the Mughal emperor Aurangzeb, then later by the Nizam of Hyderabad, who in turn conceded it to the Marathas, who themselves surrendered it to the Britishers of the East India Company. The Sultanates built a vast number of mosques in the city and many of them have withstood the ravages of time. The most popular one among tourists is ofcourse, the magnificent Gol Gumbaz. The title of second largest dome in the world may be invalid, but it definitely is among the largest domes when it comes to heritage structures. Read history buffs, read ! He should’ve known nothing spurs me on better than a challenge. But what a capture this one turned out to be ! Climb through the 7 storeyed staircase to the gallery above. Each viewing area is covered with grills, and for good reason too. Finally, the last storey of the minaret ! I approached the edge with quivering knees. Any acrophobiac peering down from a height of 35m, separated by only 3 railings, will understand. The popular whispering gallery inside the dome, where any sound made echoes 7 times and even a sound as faint as a whisper can be heard, is inundated by a cacophony of shrieks, whistles and whoops made by the visiting tourists. Your best bet to avoid all that would be to visit the structure early in the morning. The gallery itself is a semi-octagonal structure that looks down upon the floor below. I could not even muster the courage to put my camera on the gallery and shoot at the view below, you see, heights petrify me like nothing else. It was a relief therefore, when we made our way down the staircase. Terra firma never felt so good before and I could have almost kissed the ground beneath our feet in gratitude. It was growing hotter by the hour and we asked the auto-rickshaw wallah to take us to the other sites. He took us in turn to the Jumma masjid, the Jod gumbaz, the Taj Bavadi, the Upli Buruj, the Landa Kasab gun, the Malik-e-Maidan, the Ibrahim Rouza before finally dropping us off at Bara Kaman. 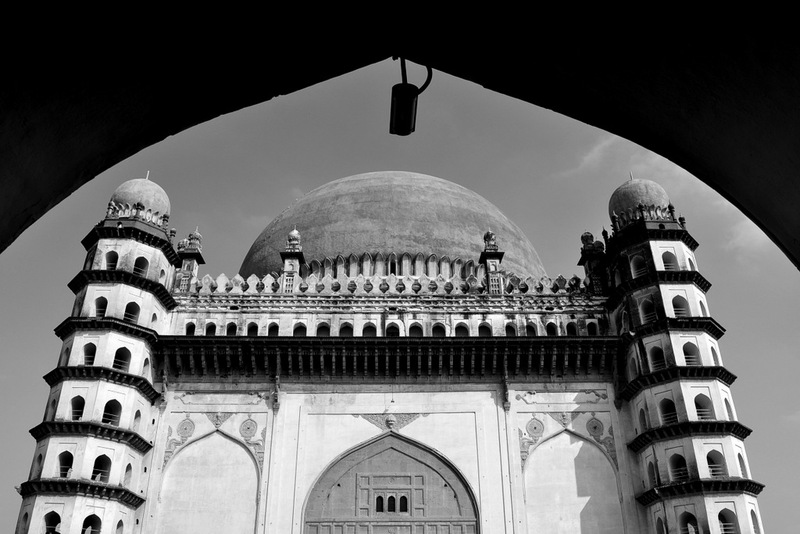 Beware though, none of these structures barring Ibrahim Rouza may excite you as much as the Gol Gumbaz did. Not for us anyway. The Taj Bavadi for example, is a very ill-maintained tank that has a lot of garbage floating in its stinking green waters. The Jod Gumbaz pales significantly in comparison to the magnificent dome I wrote about earlier. The Upli Buruj does afford a good view of the city, but you’ve already seen a better view from atop the Gol Gumbaz. Of course it would be best to hire a guide or take a guidebook along if you are interested in the history behind all of these structures. Although I did have the inclination, we were so enamored by the grandeur of the Gol Gumbaz that everything else looked dis-interesting. As in any religious place, you are not allowed to take your footwear inside the prayer area. The masjid itself, is a beautiful sight but we could not approach the mihrab as there seemed to be a nikaah going on, followed by prayers. First view of the beautifully manicured lawns of Ibrahim Rouza. The structure on the left seems to have been the inspiration for the Taj Mahal, or so the story goes. Unfortunately, as soon as I entered the gates of the Ibrahim Rouza, my camera’s battery light started blinking. It wasn’t bad luck, it was sheer stupidity on my part to have assumed the battery would go on for the entire weekend. The structures themselves however, were so breath taking that for a moment, I forgot all about the dead battery and just walked around, taking in the beautiful carvings and relief work on its walls. Later, we paid a visit to Bara Kaman. Again a quaint structure, it was never fully completed and it is argued that should it have been completed, it would have been bigger than the Gol Gumbaz itself. The tour almost completed, we settled for some delicious ice-cream to gain some respite from the afternoon heat. There is an Amul ice-cream outlet right on the road that leads to Bara Kaman and each of us had at least 2 cups with different flavors. We had lunch at a hotel near the bus stand afterwards and then retired to our hotel rooms, before catching the return bus to Bangalore at 7.00 in the evening; marking the end of yet another weekend getaway to one of Karnataka’s rich heritage cities. P. S. Somehow, I feel the romance of travelling in a bus or train overwhelmingly beats travelling in a private vehicle any day, an opinion that was reinforced during this trip. The best time to visit these places would be from September to January. Although we covered Badami, Aihole, Pattadakal and Bijapur in a weekend; given a choice I would definitely devote a day for just Pattadakal, Aihole and maybe include the Mahakuta temple as well, another day just for exploring Badami’s cave temples and Badami fort. Bijapur can be done in one day too. And a guide, guidebook or smart phone app is strictly recommended for each of these places too. The food and transportation in Bijapur is cheap and delicious, remember to bargain well with some of the auto-rickshaw wallahs. Till the next trip report then. well written! I am sure comng over again to read more fo your travelogues! Thanks ! I was tempted to undertake a trip again after reading your travel post on Dudhsagar !! Loved reading your post.. All 3 parts were awesomely written.. Thank you. Bijapur, Gulbarga and Bidar are some rich historical gems that north Karnataka has. You should visit them. Such nice photos; great Rahul! Very well description of Bijapur.Thank you for sharing the beautiful pictures. Your blog correctly states that Bijapur is rich in many other historical attractions. There are many places to visit in Bijapur and it is well known for its historical monuments of architectural importance built during the rule of the Adil Shahi dynasty. Its a must visit place to explore our history.